Objects such as the Ardagh chalice or the Derrynaflan paten are obviously very special. They belonged to a social and ecclesiastical elite and were used rarely, if at all. What was ordinary religion like? How did most people interact with the world of the saints? This unique shrine gives us some sense of popular faith and ritual in eighth century Ireland. The shrine, discovered by turfcutters in a bog in Co. Sligo, is made up of four hinged, copper alloy plates, each enclosing a fragment of a simple leather belt. The belt clearly belonged to a popular early saint. The bog at Moylough where it was found is not far from the site of an early monastery at Carrowntemple, so there may well be a connection to this holy place. 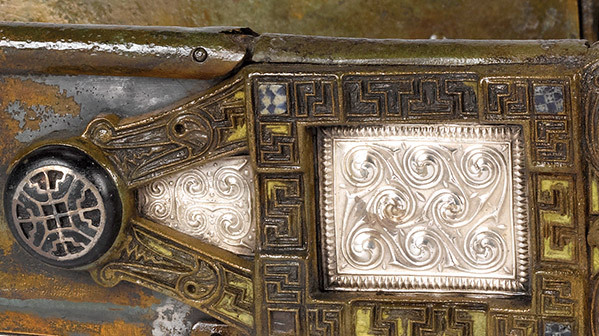 The shrine is itself in the form of a belt: the two front plates form a false ‘buckle’ whose frames are decorated with bird and animal heads and end in elaborate glass pieces. The overall impression is somewhat dulled now: originally, the belt would have been a riot of colour, with shiny silver panels, blue and white glass studs, and red and yellow enamel borders. What is particularly interesting about the shrine, however, is that it was not kept in some monastic treasury, away from the ordinary believers. The patterns of wear on its surfaces show that it was much used. What was it used for? Miracles and blessings. There is something very intimate in the way this relic was deployed. The hinges and the wear and tear show that it was actually placed around the bodies of devotees. Monks themselves regarded the belts of their holy predecessors as a form of spiritual protection. One Irish monk in Austria wrote that ‘the girdle of Finnan’ protected him ‘against disease, against anxiety, against the charms of foolish women’. Presumably, the devotee hoped to gain this same protection, at least against the first of these evils. Saints’ belts even acquired a frankly magical aura. In a Scots Gaelic legend, the hero MacUalraig uses the ‘magic belt of Saint Fillan’ to capture a water nymph. The Moylough belt shrine was probably placed around the bodies of supplicants who came with all sorts of illnesses, wounds and deformities. There is a particularly strong early-mediaeval tradition in Western Europe of the belts or girdles of saints being placed around the waist of a woman undergoing a difficult childbirth. There are later records of the purported girdles of Ss Joseph, Margaret of Antioch, Brigid and many others being used in this way. The elaborate nature of the Moylough shrine makes it highly unlikely that it was actually used for women in labour, but it may have been placed on pregnant women as a blessing to ensure safe childbirth. It reminds us that, for all the sophistication of early Irish Christianity, for most people religion still functioned as it always had, as a way of trying to control an unpredictable and often frightening world.